Always hard working and tenacious, a series of adverse circumstances in the early 1980’s left Chris Gardner homeless in San Francisco, the sole guardian of his toddler son. Unwilling to give up Chris Jr. or his dreams of success, Gardner climbed the financial industry ladder from the very bottom. He worked at Dean Witter Reynolds and Bear Stearns & Co before founding his own brokerage firm in Chicago in 1987. The amazing story of Christopher Gardner’s life was first published as an autobiography, The Pursuit of Happyness, in 2006, and became a New York Times and Washington Post #1 bestseller. The book spent over twenty weeks on the bestseller list and has been translated into more than forty languages. Chris Gardner was also the inspiration for the movie The Pursuit of Happyness. The film starred Will Smith as Gardner and he received Academy Award, Golden Globe and Screen Actors Guild nominations for his performance. Gardner was also an associate producer on the film. In his second New York Times bestselling book, Start Where You Are: Life Lessons in Getting from Where You Are to Where You Want to Be, published in 2009, Gardner shared his philosophies and crucial steps behind creating a fulfilling, successful life. 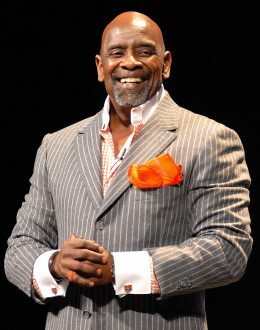 Since Chris Gardner’s remarkable transformation from homeless single father to millionaire, he has been inundated with two questions: „How did you do it?” and „How can I do it too?” Chris Gardner’s aim, through his speaking engagements and media projects, is to help others achieve their full potential. His practical guidance and inspirational story have made him a frequent guest on CNN, CNBC and the Fox News Channel. He has also been featured on The CBS Evening News, 20/20, Oprah, Today Show, The View, Entertainment Tonight, as well as in People, USA Today, Fortune, Entrepreneur, Jet, Reader’s Digest, Trader Monthly, Chicago Tribune, San Francisco Chronicle, The New York Post and the Milwaukee Journal Sentinel, amongst other publications. Christopher Gardner’s childhood was marked by poverty, domestic violence, alcoholism, sexual abuse and family illiteracy. Gardner published his autobiography out of a desire to shed light on these universal issues and show they do not have to define a person. Gardner never knew his father, and lived with his beloved mother when not in foster homes. Gardner joined the Navy out of high school and after discharge, moved to San Francisco where he worked as a medical research associate and scientific supply distributor. In 1981, as a new father to son Christopher Gardner Jr., he was determined to find a career that would be both lucrative and fulfilling. Fascinated by finance, but without connections, an MBA or even a college degree, Gardner applied for training programs at brokerages, willing to live on next to nothing while he learned a new trade. Chris Jr.’s mother left and Gardner, despite his circumstances, fought to keep his son because, as he says, “I made up my mind as a young kid that when I had children they were going to know who their father was and that he wasn’t going anywhere.” Gardner earned a spot in the Dean Witter Reynolds training program but became homeless when he could not make ends meet on his meager trainee salary. Today, Gardner is involved with homelessness initiatives assisting families to stay intact, and assisting homeless men and women who are employed but still cannot get by. As a single parent for 25 years, Chris Gardner has demonstrated his concern for the well-being of children through his work with and on behalf of organizations such as the National Fatherhood Initiative, the National Education Association Foundation and the International Rescue Committee. Gardner is still very committed to Glide Memorial Church in San Francisco, where he and his son received assistance in the early 1980’s. Gardner has also been honored by the NAACP Image Awards; Los Angeles Commission on Assaults Against Women, The Continental Africa Chamber of Commerce, The Glaucoma Foundation, The Securities Industry and Financial Markets Association (SIFMA), Covenant House, Common Ground and other organizations committed to combating violence against women, homelessness, and financial illiteracy – issues of the utmost importance to Gardner.